In every industry there are combinations of products that just don’t make sense to combine. We are taught that oil and water don’t mix well. Some antibiotics are better taken with water rather than milk. Basic ingredients don’t mix well with acids, such as milk and grapefruit. The list goes on and on. I point this out because a new innovative marketing gimmick has just been introduced in the dog food world that suggests the combination of freeze-dried raw food nuggets with kibble. 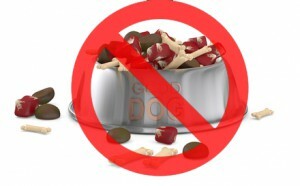 I have been teaching for years that combining a raw diet with kibble is a hard combination for pets to digest. This is because the digestive time frame of each diet is different. As such, you confuse the pancreas when generating the right combination of digestive enzymes. This often results in gastrointestinal upset (mainly diarrhea and vomiting) and in some cases, long-term depression of the digestive and/or immune system. It cannot be a reduction in price because using freeze-dried nuggets is an expensive alternative to a raw food diet. It cannot be to offer a better digestive advantage because of the aforementioned variance in the digestion cycle. So what exactly is the benefit? Perhaps it offers consumers a product that can be used while traveling. After all, a frozen, raw diet isn’t always as easy to store and manage while traveling long distances without proper refrigeration. Then again, pet owners that are true believers in the amazing benefits of a raw diet would use prefer to opt for a freeze-dried raw diet product during travel, forsaking kibble entirely. Then there is the customer that chooses to use kibble in combination with a natural, raw food diet in order to reduce the cost of feeding large/giant breed dogs or multi-dog households. What I often tell these people is to split the raw and kibble feedings – feed the raw diet in the morning and the kibble at night – and under no circumstances should they combine these two diets into one meal. This usually eliminates any digestive issues and at least introduces an improvement in nutrition for the animal by feeding half raw. I always question when a company promotes themselves as raw food enthusiasts and at the same time promotes kibble. It seems as if the desire for profit supersedes the desire to do what is best for the health of the animal? As you all know, I am not a believer in feeding our pets a kibble diet. They are not naturally designed to ingest cooked diets, especially those that contain filler ingredients like corn and grains. But this new concept of combining raw and kibble is even worse because these two diets just don’t mix well. Mixing kibble and raw is like mixing oil and water. I feed my dog grain-free (Acana Regionals) kibble and crumble up a couple of pieces of Stella and Chewy’s Carnivore Crunch (dehydrated raw) and mix it in. She does fine with it and has no digestive issues. Thanks for your response Mary. Yes some dogs do okay on a diet that is raw mixed with cooked food but in the long-term, it can cause digestive issues so that is why we recommend that pet parents split these two diets into separate meals with enough time in between for your pet to digest each diet separately. It’s also good to mention that dehydrated “raw” diets are not really 100% raw as they do go through a heat-process which breaks down some of the nutritional value. Freeze-dried raw is better but still does not stand up the the real stuff! Raw food diets are frozen to reduce pathogens and also have a high water content that is better absorbed by your pet than water added back into a freeze-dried or dehydrated raw food diet. I want to feed my dogs the bravo raw but how long do you wait till you give them kibble? I feed my dogs kibble and raw diet. I do it because I worry that I don’t know the right vitamins and minerals to add. My dogs will get that from the kibble… I hope. I also feed raw and kibble together and they have never had a problem. Sometimes they eat all the kibble and sometimes they don’t. I have 4 dogs 2 pitbull/pitbull muxes and 2 chihuahuas. They range in age from 3 years to 10 yrs. It is great that you incorporate a raw diet to your dog’s daily meals.